Electric smokers have been in use for years now and make a great addition to any home. The best electric smoker needs to satisfy things like temperature control, sensor, makeup, cooking capacity, wood chip compatibility, and control. In this post, we are going to review the best electric smokers with a window in the market for you to buy. These are affordable and convenient smokers that will give you value for your money. Read our reviews and choose a smoker that best suits your needs and desires. This is a versatile electric smoker and one of the best choices to start our list. It is a large smoker with 720 sq. Inches of smoking space. Inside the smoker features four chrome-coated smoking racks that can hold up to 100 pounds of food. 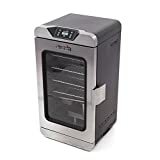 It allows for excellent temperature control when cooking from 100-275 degrees F. Overall; this is a convenient electric smoker with side loading chips, top air damper, and a removable drip pan. You can also watch as the food cooks through the viewing window at the top. Masterbuilt electric smoker is a leading brand, and this smoker is a great buy with excellent features. It is a fully-insulated smoker with digital control for on/off, timer and temperature. The inner side features four chrome-coated racks and an adjustable air damper to help you control the smoke. It is a quality smoker with a patented side chip loading system that allows you add chips without opening it. You’re sure of consistent smoking due to the integrated thermostat temperature control. Char electric smokers are known for their quality and sturdy construction, and you can never go wrong by choosing this one. It is a quality smoker with an insulated double wall construction to keep the heat inside. The smoker features an advanced digital control panel that allows for easy readouts. The food thermometer is also removable for easy cleaning and maintenance. The steel locking latch is large and stainless to keep a tight seal. This is a vertical Char-Broil electric smoker with a massive 505 square inches of cooking space. It features three adjustable chrome-coated racks to place your food as it smokes. The construction is sturdy and durable with a full body insulation and double-wall construction. This helps maintain even temperatures. The smoker also features a water pan and wood chip. There is a further lid mounted temperature gauge with a bezel. The Smoke hollow smoker is another unique design with a new window and latches design. The smoker comes with a 1500 watt heating element for fast food smoking. It also features a fully removable and adjustable temperature control. The double-wall construction of the cabinet prevents heat loss maintaining even temperatures. Overall, this is a great buy with high temperature painted wood chip box and coated water pan. It ships with three cooking grids. The Bradley smoker is another great addition to any home with a sturdy and durable stainless steel construction. It is a quality smoker with a stainless steel interior to serve you for long. The smoker feature heat control which helps eliminate moisture. Moisture in the smoker damages the switch. Rack supports on this smoker helps prevent the racks from tipping over when heavy food is placed on them. This is a front loading electric smoker with a consistent temperature setting for even food smoking. 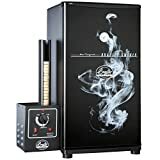 It is a highly rated smoker that one can buy with confidence. The smoker easy-glide chrome coated grills for easy food placing. It is a sturdy and durable smoker with an embossed aluminium construction ideal for outdoor use only. It comes ready for use without any assembly required and two-year warranty. The drip pan is dishwasher safe allowing for easy cleaning. The Landmann electric smoker is a durable and high-quality USA made the product that will serve you for long. The smoker features a 3-in-1 tray that holds wood chip box, water pan, and the grease tray in a single component. It is a double wall construction smoker with a viewing window at the top. Temperature control is independent helping maintain constant temperatures throughout the smoking. The feet are adjustable on four feet levels for better stability on uneven surfaces outdoors. 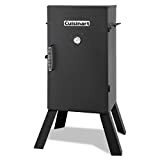 Cuisinart is a big name in the industry, and you can never go wrong choosing the Cuisinart 330 electric smoker. It is convenient and easy to use smoker ideal for beginners. You simply need to plug in and place your meat on the racks. You can then set the temperature and let it smoke. The thermometer is easy to read and placed on the front door to monitor easily. Overall, this is a lightweight frame construction smoker with two side handles for easy mobility. It features a 1500-watt heating element that delivers 100-400 degrees F temperatures. The Smokin-It is our final pick and an excellent smoker that loads up to 22 pounds of meat per single load. It is a massive smoker with a 400-watt heating element. The smoker uses the single phase 120V making it a suitable pick around the home. It is highly mobile with three inches diameter rubber casters. There are three removable shelves, but one can add up to four depending on the size of the meat you want to smoke. 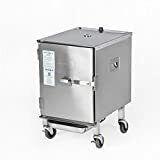 Overall, this is a quality stainless steel construction smoker with side handles for easy lifting. If you want to smoke your meat, then these are the best electric smokers on the market to buy. They have excellent features and offer great value for money. The smokers are highly rated and pretty easy to use making them a great buy. Go right ahead and choose one that suits your needs today.